I have completed D4 Modding sometime back, finally I have some time to write this (it so happend I wrote this at about some 25,000ft above sea level). It does seem that most of the modders are busy with the Fi.Q very lonely here. The changes started off as a Dream of using the D4 at 9V or 12V which proved to sound much better than 5V especially for bigger headphone and definately HD600. At 12V it drives HD600 comfortabily close to a desktop amp. The DC to DC converter consists of a filtering circuit before going into the up-converter. A regulator to regulate the voltage to 12V and a enhanced Pie Filter. When I was taping the 5V from the D4 I noted 2 nos of zero ohm resistor at position L1 and L2 I think the designer at ibasso have in mind 2 little ferrite beads or some small inductor but at a later time decided not to install it. I took out the 2 zero ohm resistor and replace it with 2 small inductors. This would help to reduce ripples at the power lines. 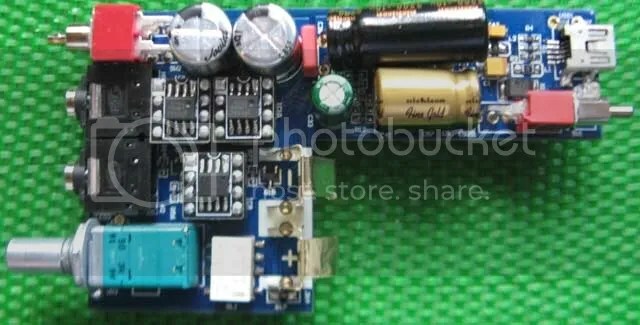 There are 2 different power regulator, one for the AMP (L/R and BUF), and another for the DAC + 8616. The AMP reservoir chosen by iBasso was a 10V 2200uF Nichicon HZ series Capacitor, This is a very good choice by iBasso, Given a choice I would not have change this but the rating of 10V was insufficient and I was force to change it to a 16V part. I chosen a Rubycon ZL series. The DAC Capacitor needed to be change the 100uf Nichicon Fine gold would not cut it here, I replaced with a Sanyo WG series 1800uf. The reservoir for 8616 was likewise replace with OSCON with WIMA bypass. 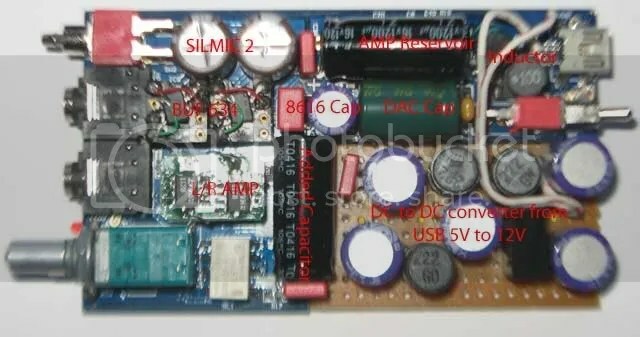 When I solder the DC converter to D4, I preferred to remove the battery connector, with that removed I have additional space to put in another reservoir for the AMP. A similar Rubycon ZL. A diode D1 was removed as it was no longer needed. D1 is to prevent a a short if the battery is inserted with the wrong way. Since there would not be a battery here, there isn’t a chance of that happening. By removing that I have an additional 0.4V. Buffer used here are BUF634. They proven to be a favorite and is notably better for big cans. L/R Just when I was about to settled with 797ANZ, someone in the forum bite the bullet with 797BNZ, Hopefully he does not posion the owner of the D4, means more work for me. Additional mod possible is to remove the relay, It is not needed as the owner is mainly using this from powerbook. Do you think I have void the warranty of this D4 ? Hi, I’m interested in buying the iBasso D4 and modding it to 12v, which would really help make my headphones sound better. Could you post more details on this mod? Thanks in advance.